It was a beautiful September weekend and the sun was shining on my drive through the beautiful Argyll and Highlands countryside and onto Oban . This is always a stunning drive through Loch Lomond and onwards through Crianlarich and today was no exception . 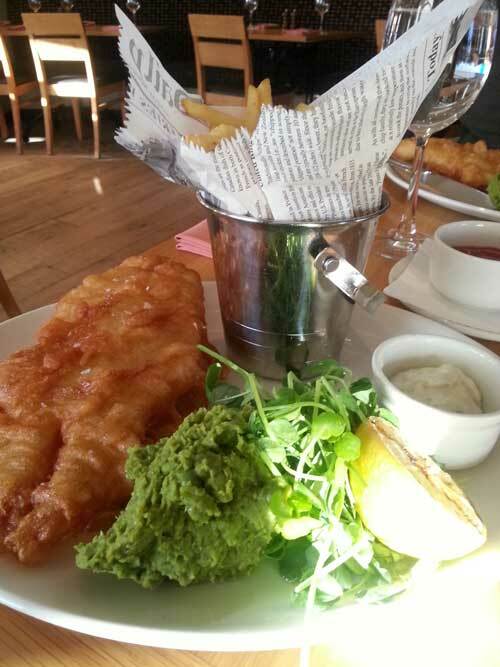 The Oyster Inn at Connel is absolutely brilliantly situated overlooking Loch Etive and views to Mull , Lismore and Morven . The Restuarant is an ideal place to lose yourself and unwind with the views alone - but the food ........ ! On arrival at this small and cosy Inn you are greeted by wooden floors and creels and seafood memorabilia everywhere , no doubting this a place for good seafood . I absolutely loved the decor here and the bar was just fantastic full of character . The rooms are spacious enough and are set at the back of the building with all mod cons and spotlessly clean . This is a 4 Star Inn and the reason in my humble opinion is for the food . I had quite simply some of the best seafood and fish ever served to me in Scotland and not overpriced or over rated . This restuarant is not pretentious, but our young male waiter knew his job inside out and his knowledge not only on the food but the wine and surrounding area should be commended. An absolute credit to the hospitality industry and he should be a shining example on how to treat and serve customers in a dining experience . I digress , My associate had the biggest wooden slab of the biggest and juiciest Langoustines i have seen , whilst i had succulent sea bass served in a thai style soup with noodles . Excellent all round 3 courses were consumed and not rushed . I love love love this place and can not sing its praises high enough. I will be back very soon Oyster Inn at Connel . This weekend i had the privilege of staying at many beautiful Hotels ,none more so than Knockendarroch House Hotel in Pitlochry . This beautiful Hotel was once the home of an Aberdonian lawyer back in 1880 . It was sold in the early 1900s to a jeweler - James Robb who then sold it on to the newly formed Pitlochry Theatre Company . In recent times a new family - McMenemie took the home over and turned it into todays finest Hotel in Pitlochry. 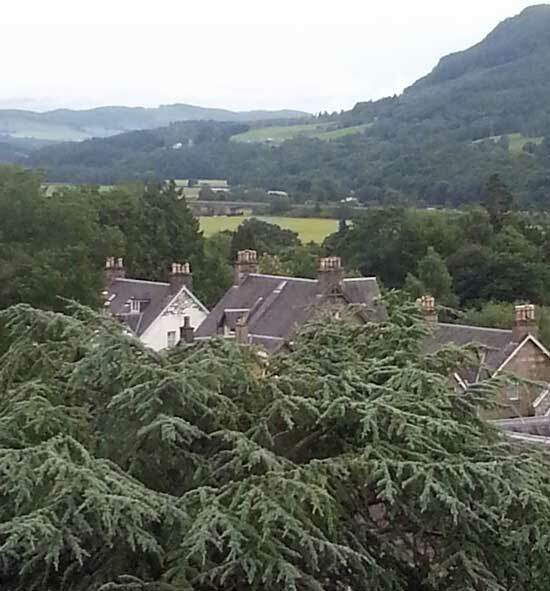 The Hotel has a 4 star rating and most certainly has earned it with its majestic views alone , overlooking stunning countryside from an elevated and enviable position in Pitlochry. I stayed here one night only and will certainly return. From the moment i entered the welcome was unobtrusive and friendly , just the way i like it. My room was quite simply breathtaking with views from large glass windows on two sides of the room. Very clean , quiet and well equipped . The most pleasing reason for my review however was the dinner and breakfast which was served in informal surroundings , but just excellent. From the onset i had canapes in the lounge before making my way through to the small but atmospheric dining area. My choice this evening was seared scallops on a bacon mash which were cooked brilliantly , piping hot and a work of art on my plate- too good to eat ! Pork medallions and to finish a strawberry shortcake. The breads were all homemade and actually the best bread i have eaten to date in any restaurant . The oatcakes served with the cheese were also homemade and excellent. I can not rate this location ( 2 Min walk to village of Pitlochry) , Food , Service and all round Hotel highly enough and will most certainly return for a longer stay in the very near furture. A rare day off today was spent with my Mother and sister whilst waiting for my car to be serviced. Our original lunch destination in Renfrew was closed so we headed to Linwood on a recommendation i had heard about via the website- Linwood farm. Linwood farm is actually not a farm strangely , but a division of Greene King - Farmhouse inns . On arrival i had the usual " judging a book by its cover moment" and thought i may have been sold a bogey by an anonymous web nomination . On entering we sat ourselves down and wondered how the whole thing operated - do we go to the counter or does someone come to you . In the end we asked how we ordered food and were told we had to go to the bar after looking at our menu and remembering our table number. This seemed easy enough ( Even for me ) We met a lovely lady from Greenock who told us how to order wisely ....... Armed with this information i proceeded to order a lunch carvery . I was then given a ticket a few minutes later and told to go the end of the queue and wait. My wait was not long and the choice of the carvery was one of the best i had seen in awhile. I had everything and all crammed onto a tiny plate . Roast beef, cooked ham, mashed potato , roast potato , all sorts of vegetables , gravy , sauces, onions in red wine, yorkshire puddings, cauliflower cheese ( My favourite and boy could you taste the cheese ) and so much more - very impressive, but the most impressive thing for me was at 2pm (Which is when the carvery ends abruptly ) the food was still piping hot and fresh . Yes i will be back for this carvery . 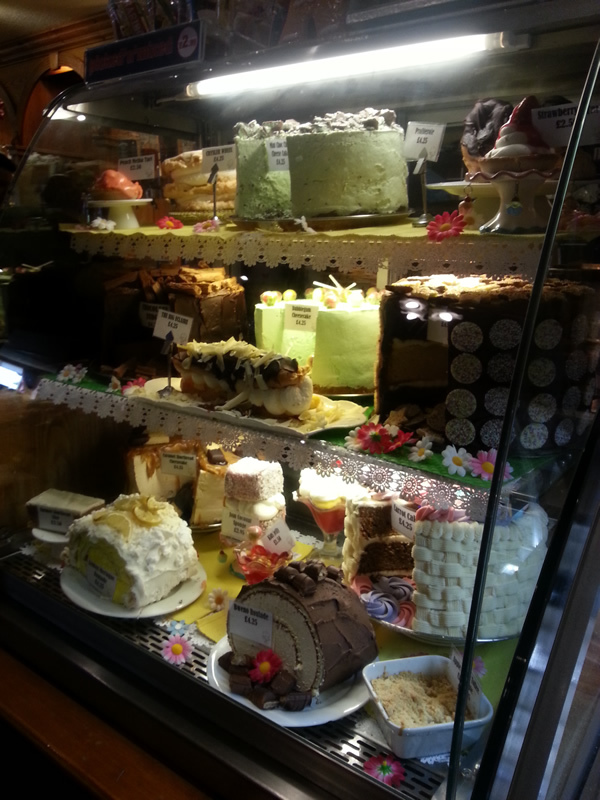 The cakes which are indeed impressive as you enter , mainly for their size , (felt like you were in Gullivers travels ) were the next on our list . My mother had a roulade which would have fed at least 6 and was impressive in size which pleased her sweet tooth. I had the Chocolate Fudge which was just ridiculously huge ( even for my apetite) . I can see the appeal for people and i like the brand regarding the cakes but in my humble opinion they were not as good as they looked. They were all size and no substance. They were also a great price and you could takeaway . The staff were regimental and lacked warmth albeit efficient. 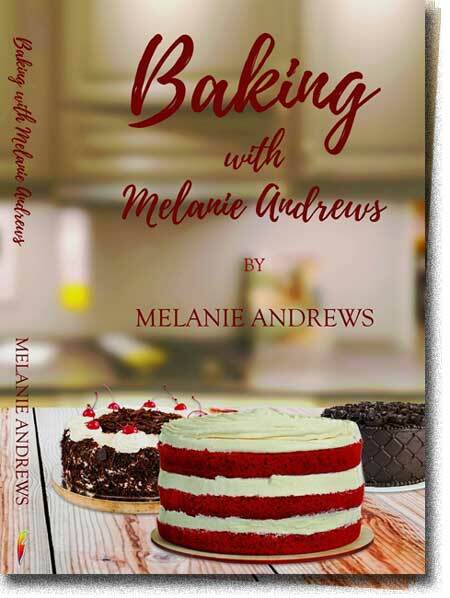 Would i recommend - yes i would certainly for the carvery and for the wow factor with the size of the cakes. See you soon Linwood Farm. This weekend was a culinary delight starting with a 7 Course Seasonal taster menu at Edinburgh's oldest cookery school - The Edinburgh School of Food and Wine. Headed up by Chris Stewart ,the trainees served up an amazing taster menu after only 3 weeks . Anyhow i digress , i stayed at the Dalmahoy Marriot Hotel and Country Club just a mere 20 minute drive outside of the capital city - Edinburgh. I was not to sure what to expect from such a large hotel ( Experience has taught me to expect less and not be disappointed ) . A Star rating or Michelin rating does not always guarentee you a great experience so do your homework. A beautiful long driveway (Immaculately cared for ) led us to the A listed stunning building that is the Dalmahoy Marriot. The original home was built in 1725 for the younger son Earl of Stair and was designed by Wiiliam Adam. I absolutely love this type of Hotel mixing the old with the new effortlessly. The new hotel built in 1990 adjoining the original accomodates a restuarant , swimming pool ,spa and more accomodation. The countryside in which this hotel is set is quite breathtaking and definately feels like a retreat. The best thing about this Hotel is its quality of staff , cleanliness of everything you touch,standard of furnishings ,food , ease of sleep ,bed comfort , etc etc etc . I honestly could not fault this Hotel from start to finish . I ordered room service efficiently and effortlessly ,not overpriced. The pool was immaculate . For two nights in a large Queen room with side passage for extra room i payed £200 and this included all the facilities,breakfast and golf courses on site . The breakfast was a great display of fresh fruit, juices,pastries, buffet style breakfast with the addition of a cooked hot to order breakfast if you wished . As far as Hotels go this was a 10/10 . I will return one day for sure !! Today was a crisp cold and snowy day for a drive through the Perthshire countryside and on to Crieff Hydro . My initial pit stop turned out to be fully booked at Gleneagles so this was quite a relief to be in in the warmth . I have never experienced anything quite like this immense building elevated over some of the most stunning Perthshire countryside. Absolutely everything you could want is at your fingertips in this 4 * Spa resort. It has the obvious perfect setting , a fully equipped swimming pool with victorian spa and all the extras. It has about 3 or 4 different dining experiences . One of these dining experiences was inside a beautiful conservatory with stunning views of the grounds and countryside. This Hydro also houses a fully equipped cinema, golf courses,childrens entertainment etc etc etc etc . I could go on and on as i was impressed but i wont digress . Firstly the staff in this hydro were very friendly , helpful and eager to chat ( Extrememly rare in a place of this size ) and that makes your experience so much better. I opted for the Downstairs Brasserie which i found through a maze of corridors and gift shops and totally spotless surroundings. Again i was seated at the window by very helpful friendly staff. Service was quick, efficient ,friendly and best of all the Fish was Fresh - what a revelation in such a huge place . Excellent food ,iced water poured on arrival and in an informal atmosphere- great . My only complaint was the dessert menu ( About 3 choices ) and not a great dessert sadly but i would return if only for the fish . Great place and i would highly recommend for a family break or just the FISH ! 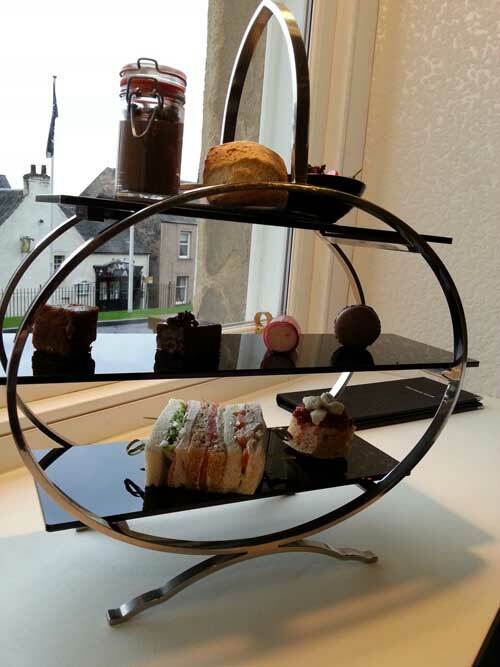 Stirling's Newest 5 Star Hotel opened its doors in July 2014 . A truly Victorian Landmark with magnificent grandeur awaits you . My drive through to Stirling today was a bleak dull experience on a cold November day in the Heart of Scotland but this Magnificent Building put a smile on my face. The entrance to this hotel is through massive Victorian pillars and the reception of the Hotel is refreshingly modern. If you like Black and White then The entire dining area and bar area is for you . Quite surreal leaving a Victorian era and entering a Modern and bright open plan expanse. I was greeted warmly by the Bar and waiting staff ( Also in Black and white ) . The dining area has a window view and looks out over Stirling and hills beyond . 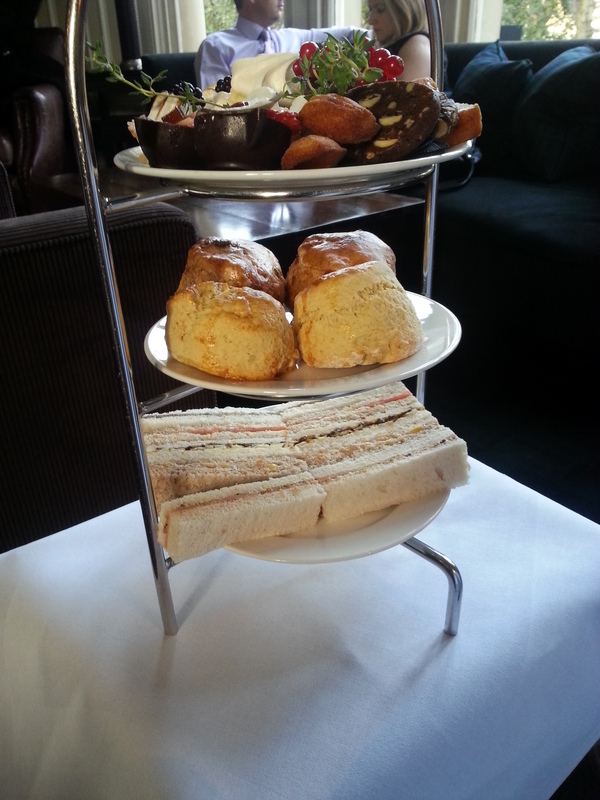 There is a choice of 4 or 5 different Afternoon Teas of which the Chocoholic was right up my street. If presentation and elegance was all i was scoring then this is a 10/10 . 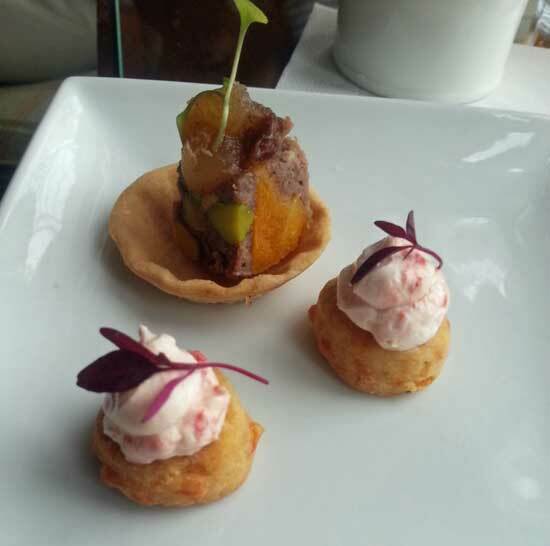 Beautifully presented on a Black 3 tiered display were dainty little finger sandwiches and a pizza type bite size delight. The middle tier was home to 4 bite size Chocolate pieces - A macaroon , White chocolate Canelloni ,Brownie and a Ganache type crisp . All very nice . The top tier had a Plain scone with a questionable Home made praline and chocolate spread ( Tasted like Nutella) Sweetened Cream and a strawberry . There was a pot of Twinings tea included in the price of £12-95 and i thought this was a good value for money Afternoon Tea . If you want to impress with a Victorian Building ,5 Star rating ,decor and Nice pleasant and mannerly staff then this is a good choice for your money . All the best Hotel Colessio.